"A Santa portrait forms the centerpiece of this appealing volume's antique-looking board cover, which is framed with decorative gold-colored embossing meant to suggest the lavishness of Victorian-era gift books." 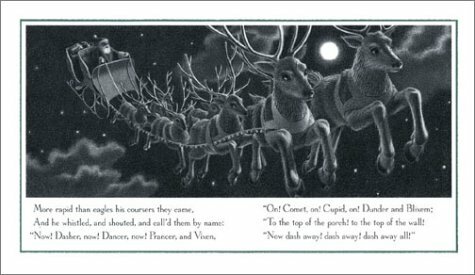 "...a beautiful version of 'Twas the Night Before Christmas, with the celebrated illustrations of Matt Tavares. Don't be put off by the fact that it's in black-and-white: This art is so stunning that children, and parents, will find the book much more appealing than a cheesy color version." 'TWAS THE NIGHT BEFORE CHRISTMAS. Copyright Â© 2002 Matt Tavares. Reproduced by permission of the publisher, Candlewick Press, Inc., Cambridge, MA.